Samsung Electronics, the number one TV manufacturer worldwide for the past 10 years, unveiled its spectacular new line-up of SUHD TVs at CES 2016, ushering in a new decade of global TV leadership. CES attendees can experience Samsung’s 2016 SUHD TVs and the company’s other innovative home entertainment products at booth #11906 in Central Hall. Samsung’s 2016 SUHD TVs feature the world’s only cadmium-free, 10-bit Quantum dot display, offering the most true-to-life picture quality, with stunning brightness, exceptional contrast and the most lifelike colors ever offered by Samsung. The vast majority of Americans watch TV with light in the room (86 percent on a typical weekday, 85 percent on weekends) and only a small share say they watch in complete darkness (14 percent on weekdays and 15 percent on weekends), according to a recent consumer survey*. Samsung designed its new SUHD TVs to deliver the optimum viewing experience, regardless of the lighting environment. This year, all of the Samsung SUHD TVs will feature the ability to provide a premium high dynamic range (HDR) experience, with 1,000 nit HDR minimum for a higher level of contrast between light and dark images. New Ultra Black technology also significantly reduces light reflection, further enhancing picture quality with minimal glare. Inspired by nature, Ultra Black absorbs natural light the same way that a moth’s eye enables it to see better at night. 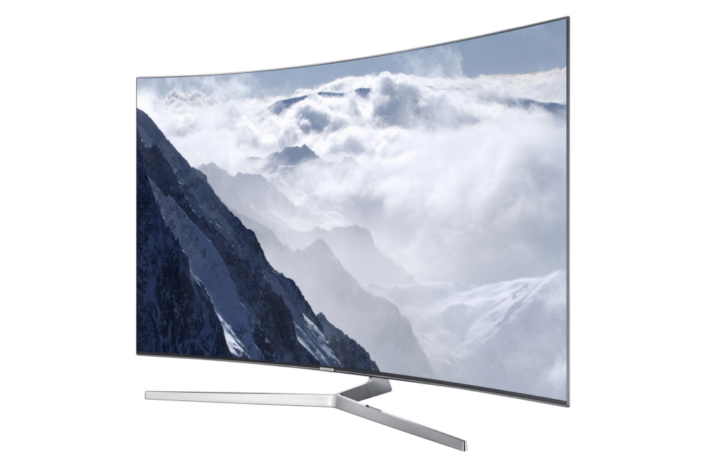 Four years after introducing the first Curved TVs to the world, Samsung has designed the world’s first bezel-less Curved TV, the KS9500 SUHD TV, to provide a more immersive viewing experience. With no bezel that normally functions as the border, the viewer’s attention is focused purely on what matters most – captivating content on the screen. In keeping with this design ethos, Samsung has sought to eliminate all unnecessary elements, even removing screws from the rear of the TV, to create an elegant product that is beautiful from every angle. 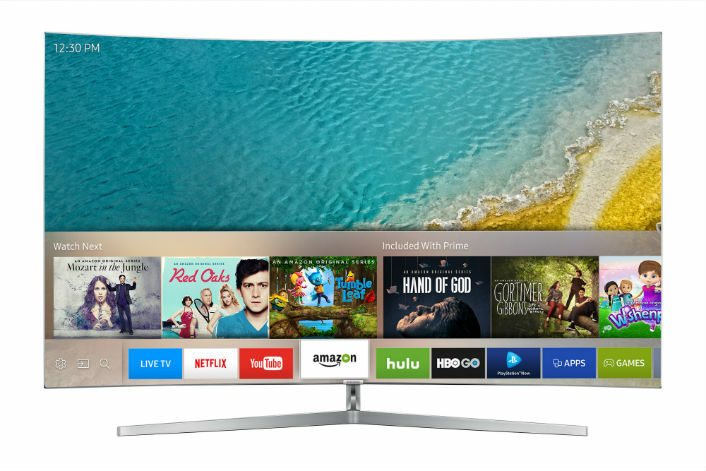 Built on the Tizen operating system(OS), Samsung’s 2016 Smart TVs make it easier for consumers to discover and access all their favorite content and services, from TV and movies to games and program information, all in one place. New Smart Hub – The 2016 Smart Hub is designed to provide users with simple access to their favorite content all in one place. Live TV, over the top (OTT), games and even the menu that appears on the home screen of the Samsung Smart TV allows users to access their favorite programs as soon as they turn on the TV. Samsung Smart Control remote – The new Samsung Smart TV eliminates the need to juggle multiple remote controls. The Samsung Smart TV will automatically recognize the type of set-top box, game console, OTT box or home theater system that is connected to the TV. This allows users to control all of the external devices with the Smart Control remote — with no setup required. Console-less Gaming – Consumers can enjoy the most realistic gaming experience on a large screen without the need for a console. More than 500 streaming and downloadable games will be available on the 2016 Samsung Smart TVs. Recent additions for PlayStationTMNow include Assassin’s Creed III, Batman: Arkham Origins, The LEGO Movie and many more. EXTRA Service – With a push of the EXTRA hot button on the Samsung Smart Control remote, information related to the content will appear onscreen instantly. Users can see player profiles and stats during sporting events, information on cast members for their favorite TV shows and more. Smart View – The Samsung Smart View mobile app allows users to share their favorite content instantly with their family. The upgraded Smart View is now available beyond Samsung Galaxy devices, supporting Android and iOS devices, as well as Window PCs. Popular apps and websites including AccuWeather, Crackle, iHeartRadio, M-GO, Plex, Pluto.TV, UFC, Vimeo, YuppTV and more are all also Smart View enabled, so consumers can begin the entertainment experience right within the apps and services they enjoy most. More access to content – Streaming UHD movies and TV shows from providers such as Amazon, M-GO, and Netflix and accessing apps such as YouTube has gotten even easier. UHD technologies developed by NeuLion will also enable a selection of sporting events to stream UHD Consumers can also connect Samsung’s new Ultra HD Blu-ray Player via HDMI (2.0a) for access to UHD movies with HDR. Direct access to live programming from providers such as Dish and Time Warner Cable is simplified. Samsung also unveiled its first Ultra HD Blu-ray Player, the UBD-K8500, which is HDR compatible and offers four times the resolution and 64 times detailed color expression of a conventional Blu-ray player. It features a sleek, curved front design, and is available for pre-order now and for purchase in the U.S. in March 2016. When paired with Samsung SUHD TV’s Quantum dot display, the new UHD Blu-ray player delivers a level of picture quality never before seen in the home. The UBD-K8500’s built-in upscaling technology enhances the picture quality from standard Blu-ray discs and DVDs, and consumers can also play CDs. Samsung has partnered with Hollywood studios to ensure consumers have a selection of Ultra HD Blu-rays with astonishing HDR picture quality. This year, 20th Fox is slated to release more than 100 4K Ultra HD discs with HDR including films like The Martian, Peanuts, and among others. *The survey was conducted online in GfK’s Omnibus from December 11-13, 2015 using the GfK KnowledgePanel®. The study consisted of a nationally representative sample of 1,020 U.S. adults, selected using random probability address-based sampling. The margin of error for this study is +/-3 percent points.